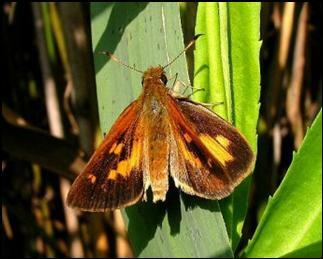 Broad-winged Skipper is often dismissed as the “Phragmites skipper” because of its association with this widespread invasive reed. Actually, it is a beautiful insect with a long and venerable native history. Scudder knew very little about this species, except that it had been reported from New England. “I have specimens, of the origin of which I know nothing, marked from Massachusetts, and Mr. Edwards long ago wrote me that Mr. Akhurst had two specimens taken by Chase at Holyoke, Mass” (1889:1606 ). We may take it from Scudder that the Broad-winged was uncommon to rare in Massachusetts in the nineteenth century. While it may have been present in native stands of wild rice prior to European settlement, it probably declined during the agricultural era (Table 1). By the 1930’s, Farquhar (1934) still terms Broad-winged Skipper “very rare in New England,” and can list no specimens beyond Scudder’s report of two from Holyoke. Broad-wing Skipper did not become common in Massachusetts until the 1980s. Its move northward through eastern Massachusetts is nicely chronicled in Lepidopterists’ Society records. In Connecticut, there are a few historical records from the 1960's, but the vast majority of records are post-1980. The earliest local specimen in the Harvard MCZ is from Warwick, Rhode Island, July 20, 1980, J. E. Friedel. The first report in Massachusetts comes in 1984, when Mark Mello reported Broad-winged Skipper as “common” on July 29 in Acushnet Cedar Swamp in New Bedford (Bristol County). That same year Harry Pavulaan also found it in Fall River, and in Wareham and Plymouth (Plymouth County). By 1987 the record northern range extension was Medford (Middlesex County), reported by D. Schweitzer and R. Godefroi. (Lep. Soc Seas. Sum. 1984-87; Schweitzer's two specimens are at Yale Peabody Museum.) By 1988 B. Cassie and T. Dodd, working for the MAS Atlas, reported it “flying within many stands of Phragmites in eastern Massachusetts.” By 1991 it was reported from Wingaershiek Beach in Essex County, but the new northernmost extension that year was Robert Godefroi’s report on Aug. 3 from Hampton Beach, New Hampshire. (Lep. Soc. Seas. Sum. 1988, 1991; Bristol County Xerxes Count 1987). (Table 2). W. H. Edwards, who first described this species, and later writers like W. J. Holland (1905), used “type” specimens from widely differing locations, and did not differentiate subspecies. What they described is now known as Poanes viator viator, the inland subspecies found around the Great Lakes and westward to Nebraska. The eastern coastal plain subspecies Poanes viator zizaniae was distinguished in 1970 by Arthur Shapiro (1970a); it extends along the eastern seaboard from southern New Hampshire through Massachusetts to Florida, then west along the coast to central Texas, and up the lower Mississippi drainage. Our wetland skippers, including the Broad-winged, Mulberry Wing, Black Dash, Dion, and Two-spotted, all probably arrived here during the postglacial warming period (xerithermic), when glacial lakes and kettle ponds across southern New England and upstate New York succeeded to marshes, swamps and bogs, and these species were able to recolonize from their southeastern refugia. The subsequent drying up of many of these marshes in central New York may account for the disjunct distributions we see today between eastern and Great Lakes populations (Shapiro 1970b, incl. maps). For the Broad-winged, there is evidence for a second migration path up the Mississippi River valley to the Great Lakes (Shapiro 1977). P. v. zizaniae’s native food plant is wild rice, Zizania aquatica, but it is among the many butterflies which have benefited from switching to a widespread non-native host plant (see Table 3, “Switchers”), in this case common reed, or Phragmites australis. Shapiro differentiated subspecies zizaniae on the basis of host plant, phenotypical, and brood differences. The inland subspecies, P. v. viator, feeds only on Carex, or sedges, is smaller, has a different ventral hindwing pattern, and is always univoltine. Our coastal subspecies is univoltine in our area, but has two or more broods south of Virginia (Shapiro 1970a; Cech, 2005; Opler and Krizek 1984). Wild rice has a disjunct eastern North America/eastern Asia distribution. Besides the east coast, it is also found in the Great Lakes area, where it may have been introduced by Native Americans, but there is no evidence that the inland subspecies of P. viator makes use of it. Both P.v. zizaniae and wild rice apparently survived the Ice Age in refugia in the southeast. Broad-winged Skipper in Massachusetts today uses mainly common reed as its host plant. The 1995-99 Connecticut Atlas volunteers observed eggs or larvae of Broad-winged on and near common reed in the wild. The skipper may also use other grasses. Common reed was formerly thought to have been introduced to North America from Europe, but stems identical to European plants have been found in peat deposits here dating back several thousand years (Magee and Ahles 1999:153). The plants now found in New England may be both alien and native (Sorrie 1999); in either case the plant has for some reason become highly invasive, choking many coastal and inland wetlands. It is found in every county in Massachusetts (Sorrie, 1999). MBC sightings per total trip reports 1992-2009 (Chart 103) suggest that Broad-winged Skipper numbers trended mildly upward from a low in 1994 and 1995 to a recent high in 2006, after which there is a slight downward trend. Note that what is not seen in Chart 103 is an explosive trend upward in sightings of this species; in fact, the overall trend is down.. A different analysis of MBC records using list-length methodology showed a statistically significant 87.1% increase in sightings of this skipper in the 1992-2010 period (Breed et al. 2012). Unusually, this result is not the same as that shown by sightings per total trip reports. The very high readings for 1992 and 1993 on Chart 103 should probably be lowered. They result from population estimates at a single location, Broad Meadow Brook Sanctuary in Worcester, which are not adequately adjusted because of the small number of reports from other locations in those years. The estimates, for example 60 in 1993, were probably quite reasonable in themselves, but single-visit counts to this site in subsequent years were much lower, and based on actual counts. Broad-winged Skipper spread rapidly into eastern Massachusetts during the 1980's (see above). The 1986-90 MAS Atlas showed its distribution to be mainly throughout eastern Massachusetts, north to the border ( http://www.massaudubon.org/butterflyatlas/index.php?id=95). The Atlas had only two reports from western Massachusetts: Southwick and Mt. Washington. Aside from those, the furthest west reports were from West Boylston, Grafton, and Berlin in central Massachusetts. The species seemed to be concentrated within a large circle around Boston, extending to the southeastern counties, Cape Cod and Martha’s Vineyard. But it “appeared to be expanding inland with the spread of Phragmites”. Map 103 confirms this butterfly's predicted movement westward across the state. 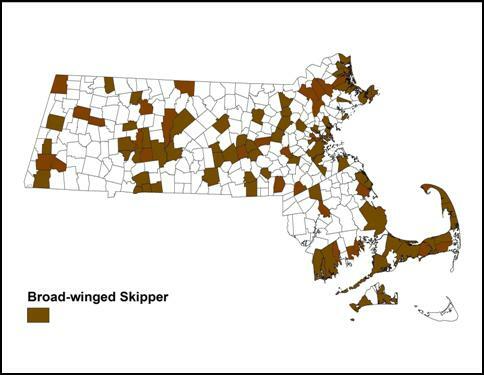 Broad-winged-skipper by 2013 had been found virtually statewide, including Berkshire County. Many more Broad-winged reports now come from the central parts of the state and westward, up to and including the Connecticut River valley. In the years shown, Broad-winged was found in 100 of a possible 351 towns in the state. This skipper seems rare in the foothills of the Berkshires, but is present (e.g. Cummington 1, 7/31/2012, B. Spencer (ph); Windsor 1, 7/19/2012, T. Gagnon). Broad-winged Skipper has been uncommon on the Southern Berkshire NABA Count until recently, but is strongly reported from Sheffield (41, 7/15/2012, T. Gagnon), Monterey, Stockbridge (10, 8/5/2011, M. Arey) and Great Barrington in recent years. On the Central Berkshire Count based in Pittsfield, on the other hand, Broad-winged Skipper is frequently reported, with a recent high of 23 in 2005. Prior to 2012 this species had not been found in northern Berkshire County, but in 2012 came the first report from that area, Williamstown Mountain Meadow, 2 on 7-14-2012 B. Zaremba (ph), along with another report from Windsor. On the Central Franklin NABA Count, Broad-winged Skipper had also not been reported through 2010, but two were found 7/13/2010 in Montague Center by M. Fairbrother. It was the first report from Montague since the single Atlas report in the 1980’s. Broad-winged Skipper is present on Martha’s Vineyard, though the checklist ranks it as “Uncommon” (Pelikan 2002). It has been reported from Edgartown and Oak Bluffs (small numbers), and Chilmark (max 21 on 8/2/1998 M. Pelikan). Single Broad-winged Skippers have also been found on the islands of Pasque and Cuttyhunk. Broad-winged has not yet been found on Nantucket (LoPresti 2011). Broad-winged is, perhaps unfortunately, quite common on Cape Cod. The species is commonly reported on all the four Cape NABA Counts: Barnstable, Brewster, Falmouth, and Truro. Mello and Hansen (2004) suggest that the Herring River/Duck Creek complex in Wellfleet hosts a large population. Worcester Broad Meadow Brook WS, recent max. 18 on 8/14/2001, G. Howe; Wenham Canal, 15 on 7/12/2000 F. Goodwin; Springfield Forest Park, 5 on 8/10/2003 T. Gagnon et al. ; Truro NABA,10 on 7/10/2010 A. Robb; Saugus Belle Isle Marsh, 40 on 7/17/2006 A. Birch; Salisbury Harbor Garden, 33 on 7/27/2008 B. Zaremba; Randolph Ponkapoag Trail, 30 on 7/31/2003 T. Murray; Newburyport Plum Island, 3 on 8/11/2007 J. Forbes; Marlboro/Northboro Crane Swamp Trail, 25 on 7/18/2010 B. Volkle et al. ; Milton Fowl Meadows, 45 on 8/11/2002 E. Nielsen; Milford power line, 32 on 7/29/2006 E. Nielsen; Marblehead Hawthorn Pond, 17 on 7/24/2006 K. Haley; Hingham World's End, 7 on 8/1/2010 B. Bowker; Gloucester, 10 on 7/27/1998 D. Savich and C. Tibbits; Eastham Fort Hill ,19 on 7/27/2013, M. Faherty; Franklin power line, 4 on 8/12/2012, E. LoPresti; Duxbury Bay Farm, 5 on 8/19/2011, B. Bowker; Dartmouth Allens Pond Quansett Nurseries, 39 on 8/12/2007 E. Nielsen; Dartmouth Allens Pond Field Station, 20 on 8/26/2009 L. Miller; Cambridge Alewife Res., 1 on 7/13/2010 M. Rainey; Boston West Roxbury/Newton Millennium Park, 18 on 8/4/2009 B. Bowker. Broad-winged Skipper flies from the beginning of July through the third week in September, with peak flight from the second week of July through the first two weeks of August (http://www.naba.org/chapters/nabambc/flight-dates-chart.asp). Earliest sightings: In the 23 years of BOM-MBC records 1991-2013, the five earliest "first sightings" are 7/2/2012, Newbury Old Town Hill, M. Arey; 7/2/2010 Newbury Stichter yard, S. Stichter; 7/4/2011 Milford power line, B. Bowker; 7/4/2001 Milford power line, R. Hildreth; and 7/5/2013 Newbury Martin Burns WMA, S. and J. Stichter. All these early sightings are in recent years, and the influence of the especially warm springs of 2012 and 2010 can be seen. In five out of 23 years the first sighting has occurred in the first week of July (7/1-7/7); in another 10 of the 23 years the first sighting occurred in the second week of July (7/8-7/14), and in eight of the years it occurred in the third week of July. Thus the most frequent time of emergence is still the second week of July, but there may be a trend toward emergence earlier than that. The early date in the Atlas years was had been 7/12/1989, Orleans, B. Cassie. Latest sightings: In the same 23 years, the six latest "last sightings" are 10/9/2007 Aquinnah J. Holland; 10/8/2010 Hingham Worlds End, B. Bowker; 9/19/1999 Westport Gooseberry Neck A. Robb; 9/17/2006 Newbury Old Town Hill M. Arey; 9/17/1998 Gosnold Pasque A. Robb; and 9/13/2009 Westport Sylvan Nursery, B. Bowker et al. There is a time gap between the two October last sightings and the more usual mid-September last sightings; this may possibly indicate a partial second brood. The last sightings have been in September or October in 10 of the 23 years under review. All of the Sept/-Oct. dates have been reported since 1998, rather than in earlier years, perhaps indicating some flight time extension. All but two are on the southern coast or the islands. The flight period of Broad-winged Skipper is rather long, and the October or even the September sightings might represent a partial second brood. The inland subspecies P. viator viator, is univoltine, but our coastal subspecies, P. viator zizaniae is capable of several broods. The classic literature reports two flights, July and August, at the latitude of Virginia, three in Georgia, and four in Texas (Opler and Krizek 2004). From older reports, only one brood has been known in New York and New Jersey (Shapiro 1974; Gochfeld and Burger 1995), but this aspect of the species’ biology bears watching given climate warming. Broad-winged Skipper today can be thought of as an indicator for disturbed wetlands, often near urban areas. The joke is that this is a butterfly one doesn't want to see. Exemplifying those trade-offs that make wildlife management so difficult, aggressive Phragmites is a host for this one handsome skipper while at the same time destroying much pristine sedge meadow habitat for other desirable sedge-feeding skippers like Black Dash and Mulberry Wing. Climate warming could increase this skipper's numbers in Massachusetts by enabling a second brood (Table 6), but this is only a long-run possibility. The immediate outlook for this species is closely tied to that of its host plant, Phragmites. As NatureServe (2012) put it, Broad-winged Skipper is fairly mobile, and will probably occupy “any habitat with Phragmites, from salt marsh to landfill.” The most optimistic prediction might be that in a longer time frame, Phragmites might settle down to become a less aggressive, more manageable part of our flora.